I missed one step the other day when I lost my post. 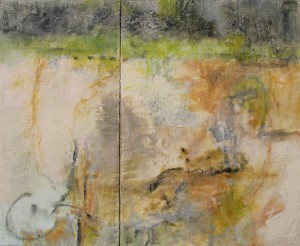 I posted a little on FB but now I am finished with this encaustic diptych., titled, Beneath the Surface 4/5, diptych…. 24 x 30 x 2 inches on cradled wood panel. I just kept adding more encaustic wax paint and medium along with making marks with oil sticks………fusing and scraping. The color for this image is better than the previous iphone photos although when you see it on your monitor it could look different. I think the original is slightly warmer than the painting image. This may be due to reflected sky lighting. Anyway……….no big techniques here, just my way of painting with encaustic which usually doesn’t involve any tricks, etc. I think I will probably frame this 2 panel piece all in one frame facilitating a hanging problem that happens when paintings are shipped off for display or exhibit. I am going to be spending the rest of the week cooking and visiting with my family……..maybe back to the studio on Friday if possible. I hope you will all have a wonderful Thanksgiving with your family and friends. LOL.. should have depth, Cathy….lots of layers…. have a wonderful T-Day… talk to you soon. have a wonderful time with kids, too…………. Chery, this is a wonderful piece. I would love to see it in person to really see the depth and texture of the surface. Thanks,, Pat. A little out of practice with encaustic but plan to do more to get back…..